I had big plans for this Fall. With my youngest starting Kindergarten, I would finally have some time to myself to do things I wanted to do. I could finally find time for a regular work-out routine. I could increase my volunteer responsibilities at church and at school. I might actually get around to cleaning out that basement closet I’ve avoided since we moved in three years ago! And don’t forget all the writing. I had big plans for writing….blog posts, e-books, maybe even launch another blog. Seriously, pages and pages of ideas for content, series, and e-books. What I did not plan for is cancer. But that’s exactly what happened. I have to admit, one of my first reactions was, “Seriously, God?!…Again?!…NOW? !” I was shocked. I was devastated. I was ticked. off. Didn’t God know that I was going to do all these things? Didn’t He know I had plans?! It’s not like I was going to sit around in front of the TV…I was going to do things–good things. Volunteer…at church. Offer my time and talents…to my kids’ school. Write…about Him. How could cancer possibly be the best path for my life? Could it be that God had another plan…one that was less about me and my agenda and more about Him and His plan? God is eternal, which means He exists beyond the confines of time. He sees all of time at the same time. He sees the end as well as the beginning. 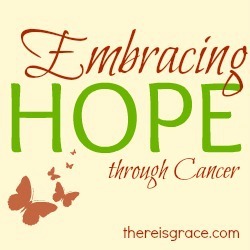 God knew about the cancer long before I did. As a matter of fact, He knew about it long before my parents knew about me. He did not cause it, but He did allow it…for a time. And if He allowed it, He must have a plan in it. That’s just the way He works. I am limited in what I can do about my situation. I can follow the advice of doctors. I can go to chemotherapy. I can take care of my body. I can pray and believe for healing. But beyond that, I have little control over my situation. If I believe that God is good…and that He loves me…and that He is in control, then it makes sense to let go of my plans. And instead of writing my stories this Fall, it makes sense to hand over my keyboard and let God write His story. I have a feeling His will be much better than mine would have been anyway! Very thought provoking. GOD is good for sure. Hi, Nancy! Boy, this is SO true! 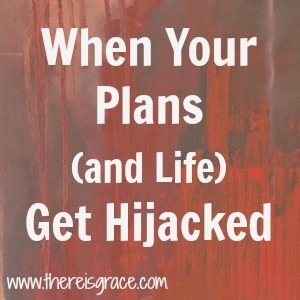 So often we think we have our lives so perfectly planned out. Then God throws in wrenches and roadblocks! I love you described how, instead of writing your story, you are letting God write HIS story! I love the verses you shared, too! May God richly bless you through this time of letting go and letting Him “steal the show”! Ann recently posted…Another Week Almost Gone! So very true. This is a beautiful post. Thank you for linking up with Woman to Woman’s Word Filled Wednesday! Thank you for stopping by, Shelly!